With Ashampoo Slideshow Studio Elements slideshows can be created easily. The selected photos are added to the editor and Ashampoo Slideshow Studio Elements automatically creates a slideshow from these pictures. 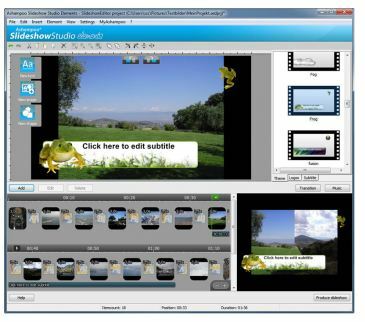 In the editor transitions can be customized and the slideshow can be personalized with texts, music and other effects. With Ashampoo Slideshow Studio Elements the slideshow can quickly and easily be saved in the WMV file format. ...... the display and transition lengths. The photos can be personalized with themes, texts, shapes and lots more. In the editor the user can also watch a preview of your finished slideshow. Qweas is providing links to Ashampoo Slideshow Studio Elements 2.0.1 as a courtesy, and makes no representations regarding Ashampoo Slideshow Studio Elements or any other applications or any information related thereto. Any questions, complaints or claims regarding this application Ashampoo Slideshow Studio Elements 2.0.1 must be directed to the appropriate software vendor. You may click the publisher link of Ashampoo Slideshow Studio Elements on the top of this page to get more details about the vendor.